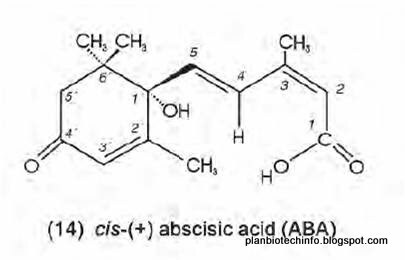 Abscisic acid (ABA) (Figure 1.) is another naturally occurring Plant Hormone. It is a 15-carbon acid; four stereoisomers exist, differing in the orientation of the carboxyl group and the attachment of the sidechain to the ring. 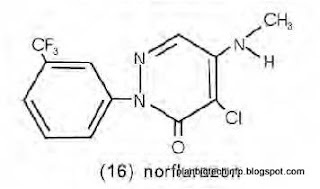 The naturally-occurring form is S-(+)-ABA. Commercially available abscisic acid is a mixture of isomers. ABA appears to be produced as a cleavage product of certain carotenoids - xanthophylls - yielding xanthoxin, which is converted to ABA aldehyde and hence to ABA (Zeevart, 1999). It has long been known that dehydration of plant tissue leads to increased biosynthesis of ABA (Wright and Hiron, 1969); however, it is now well-established that a number of other environmental factors - low (Vernieri et al., 1991) and high temperatures (Daie and Campbell, 1981), salinity (Kefu et al., 1991) and flooding (Jackson, 1991) - can also produce the same effect. ABA catabolism is complex involving either oxidation/reduction - to phaseic acid and dihydrophaseic acid - or conjugation to produce the glucose ester or glucoside (Zeevart, 1999). Biosynthesis occurs in plastids (especially chloroplasts) (Milborrow, 1974). 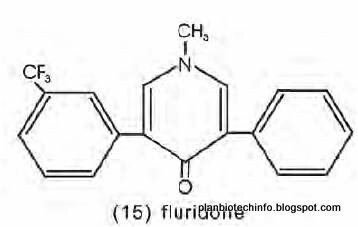 The herbicide ‘fluridone’ (Figure 2. 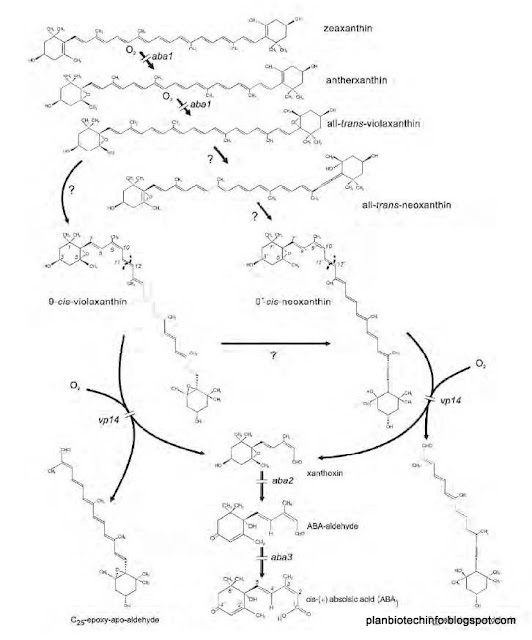 ), which inhibits the natural production of carotenoids (Bartels and Watson, 1978), can prevent ABA biosynthesis (Moore and Smith, 1984). Norflurazon (Figure 3.) produces the same effect. Abscisic acid is found ubiquitously in plants and is the most commonly identified of a number of other structurally related natural compounds, which have plant growth regulatory activity. It has often been regarded as being a plant growth inhibitor, partly because of its early history, which involved studies on bud dormancy and abscission. However, ABA has many roles in plants, such as the regulation of stomatal closure, control of water and ion uptake by roots, and of leaf abscission and senescence and hence, like other hormones has multifaceted effects. In tissue cultures, it sometimes promotes morphogenesis or growth. The quantity present in plant cultures can be determined by gas chromatography mass spectrometry or ELISA, following purification by high-pressure liquid chromatography (Ryu et al., 1988). Uptake of ABA into tissues appears to be by simple diffusion of the undissociated molecule, the anions being trapped upon entry into cells. It is decreased at pH levels above 5.5 (Minocha and Nissen, 1985; Patel et al., 1986). The early stages of ABA action probably follow the same types of mechanism as those for other hormones that is, transduction chains leading to changed transcription and translation patterns, or effects on transmembrane ion pumps (as in the case of stomata) (see Assman and Armstrong, 1999; Busk et al., 1999). More specifically, ABA has been shown to control the expression of genes specific to embryo development and maturation. Thus, using ABA-deficient and ABA-insensitive Arabidopsis mutants ABA has been shown to control genes for both LEA (late embryogenesis abundant) and storage proteins (see Dodeman et al., 1997). At another level, some of the effects of ABA lie in the hormone antagonising or modifying the effects of other hormones, notably cytokinins and gibberellins, but also auxins. For example, Charriere et al., (1999) have suggested that the effect of ABA on morphogenesis in zygotic embryos of Helianthus annuus is indirect and due to a modification of auxin levels.